výjimečně trapných či zcela logicky paradoxních. A o sobě, který tu je i není stejně tak. I want to thank the Czech artist VLADIMIR HIRSCH for his courtesy to LUX ATENEA WEBZINE sending this promotional. You will listen these musical compositions a thousand times: Each one. Masterpiece par excellence. Last December 30 was released the new album by the prolific Czech artist Vladimir Hirsch entitled "Axonal Transit". 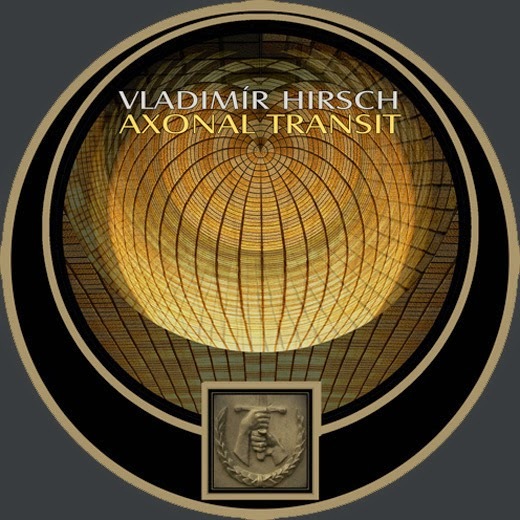 Zje album was published by Integrated Music Records label (classical in his discography), "Axonal Transit" comes with impressive design created by Vladimir Hirsch himself, pictures by Martha Camarillo, printing a modernist aesthetic to the cover, enhancing its image as the advanced concept of art that has always characterized this experienced composer. 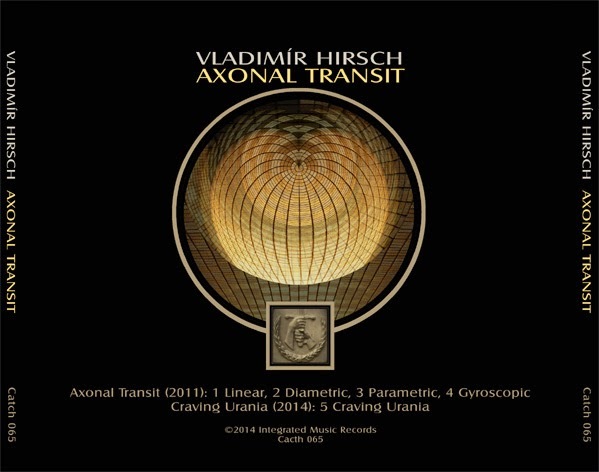 The extraordinary album "Axonal Transit" is divided into two musical sections, one homonym of over forty minutes vertebrate by four themes, in which Vladimir Hirsch incorporated the Czech Integrated Ensemble, and another one titled "Craving Urania”, a single composition of the same name that lasts more than twenty minutes. On the road to three decades devoted body and soul to the search of beauty and sublime in musical art, "Axonal Transit" shows full spectrum of sound experimentation and innovative path by its structure and definition, which gives Vladimir Hirsch’s style that artistic pioneer halo in each new musical work. 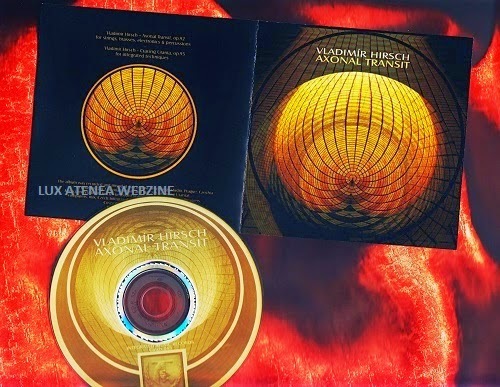 Lux Atenea Webzine musical lovers and readers may enjoy when purchasing this magnificent and glowing album destined to become a treasured collector's work prestige. A creative flame to light new musical territories that will turn on when the theme "Linear" make us crumple inexorably into this dark abyss where everything vibrates and moves to sink further into it. A deathly journey in which we will be overwhelmed and exhausted by the immense expansion of the obscure, but the sublime greatness of contemporary music will continue on "Diametric", while this spiral colossally stands before our eyes with the majesty of the measureless, leaving the vision we had of ourselves completely distorted in "Parametric" composition, where our self will reach its progressive annulment to insignificance, therefore suffering a supreme sensory expansion in "Gyroscopic", so that time and distances lose their importance in the new existential perspective. Then on track "Craving Urania", over 20 minute, the sound environment will radically change from dense and close to the ethereal and distant, passing from contemporary music decorated with dark-ambient experimental profile, to clearly defined industrial textures and this permanent state of instability where nothing is permanent or constant. A sound evolution within the musical avant-garde trends that are characterizing this second decade of the century, and that "Craving Urania" lofty reaches a polished sound despite its complexity when recreating this tortuous path to Chaos the eventual disappearance. “Axonal Transit”, from Czechia, avant-garde eclecticism created by one of the great masters in contemporary and experimental music. Enjoy!!! Skladatel a instrumentalista s občasnou obsedantní potřebou psaní článků a úvah o hudbě a umění, společenských a politických problémech, historii a lingvistice, nezřídka pak o jejich vzájemných souvislostech. Ostatní na mé oficiální stránce. Composer and instrumentalist with occasional need to write articles and essays about music and art, social and political issues, history and linguistics, but very often about their mutual relationships. Other info on my official page. Visit Vladimír's profile on Pinterest.